Overheard on CNN.com: Should Breivik be called a Christian fundamentalist? 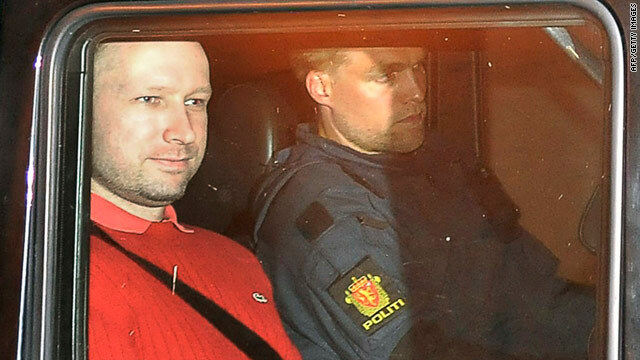 Anders Behring Breivik, a white Norwegian member of the conservative Progress Party, has been charged with the worst violence in Norway in decades. The suspect told investigators he belonged to The Knights Templar, which he described as an armed Christian order, fighting to rid the West of Islamic suppression. A manifesto bearing his name rants against Muslims and their growing presence in Europe. Descriptions of him as a Christian fundamentalist had CNN.com readers arguing over whether those terms are accurate and relevant. Yoduh99 said, "His manifesto is not specifically against Muslims but against multiculturalism and the 'Islamization' of Europe, which he believes the ruling Labor Party has allowed; therefore he went after them and their children. He's also agnostic, not a Christian extremist, though he believes in preserving the European Christian-based culture." SSearthquake said, "Stop calling him 'right-wing Christian fundamentalist.' He crossed the line and he is nothing but a terrorist and whatever his views are, he cannot be defended." indigoth replied, "I disagree. He claims he was a Christian and there's no reason to think otherwise. Sure, he committed a very un-Christian act, but that doesn't change his religion. He is a 'right-wing Christian fundamentalist,' but he is also a terrorist." faisalsh said, "Christian leaders often blame Muslim clerics of sympathising with the cause of the terrorists. I think that these events are very sad, however, it drives home the point that no terrorist belongs to any religion." IxNay said, "He is a Christian, but not one you would call a good Christian; remember that when you hear that someone is not following the tenets of Islam and you feel the need to berate the whole religion." Suburbanite1 said, "Real Christians don't kill kids in the name of Christianity." BMILL said, "An awful lot of people who considered themselves to be Christians have killed a remarkably large number of people over the centuries. In America, you have to look no further than what happened to the Native Americans for evidence." LonnieD5 said, "lol. Religion has nothing to do with this. It doesn't matter what religion you are, anybody could have something cause them to snap. The guy was a psycho; that's all there is to it. If he is a Christian, it's not even relevant." kris5967 said, "I hope the Religious Right (and all religious and patriotic people, for that matter) can learn from this tragedy. This man acted from a jumping off point of religious zeal and patriotism and he let it take him over the edge. His religious devotion became intolerance and his patriotism became xenophobia and hatred. Let him be an example to us all of what not to become." GameIsOvr said, "The same thing could happen here. This lunatic simply took Teabagger values to the next level. Anti-immigrant, anti-tax, pro-Christian, and xenophobic. All right-wing, conservative, Republican values." MartinOM said, "This is the result of extreme views. Right-wing or left-wing, it makes no difference. Intolerance is not the answer." In a CNN.com story and video, women of color told of how returning their hair to its natural texture sometimes causes strangers to reach out and touch them. Some think the response is funny, but others are angered by what they think is latent racism. CNN.com readers, however, said it had nothing to do with race and everything to do with harmless curiosity. ankelly said, "Give me a break. Why is it that black women are the only people who complain that others touch their hair? As a curly redhead, I have had my head touched a lot since I was a baby, and I don't feel wronged or write articles about exploitation. Pregnant women have their bellies touched all the time. If you are going to spend time writing an article on this, then knock off the racial victimization and keep the bigger picture in mind." cpg352223 agreed: "I'm a white guy who had well-groomed shoulder-length hair in my early 20s. During a couple of summers spent on an inner-city youth project, African-American kids - children and teenagers alike - were continuously asking to touch my hair. Why does everything have to be about race relations? Blacks and whites have different textured hair and simple curiosity is just that." maggitsmom said, "It's just curiosity. When I visited India, a few people asked about my blond hair, and some even touched it. Yes, it invaded my personal space, but I wasn't offended. They had simply never seen a white/blond person, in person, before. Can we please stop turning everything into racism?" AshKetchum said, "I am African-American and I have natural hair. I get how this is an invasion of personal space, but I don't agree with it being a racial thing. Black and white people want to touch my hair all the time. But some people have rude tendencies to just want to touch people without permission. My white friends especially tell me how soft my hair is, like their soft lamb toys they had when they were young." puddytat said, "As a black woman I have the urge to touch the hair of complete strangers of different ethnicity. I'm merely curious. I'm from the Caribbean and we've got a beautiful mix of people - blacks, whites, Indians, Asians. I once sat on the bus behind a guy with locks, and I reached out and touched his hair without permission. I felt terrible doing it, but curiosity got the better of me. I should've asked first. But as humans we come in all different colours and shapes and textures and sometimes we just want to know what the other 'feels like.' The person being asked does not need to be so sensitive. It's just hair. ..."
@ Voter...Jesus was born to parent's of the Jewish faith who were by law required to "inculcate" their children with the writings of the Old Testament.And inculcate him they did. By the time Jesus was 12, he was teaching the older men of Israel! Not in an official capacity mind you. he just astounded them with his understanding of the law. By the time he reached 30, he had years and years of memories filled with the wickedness of the Jewish High Priest that was leading an entire nation further away from God. So he dedicated his life to his heavemly father and set-about exposing publicly some of the wealthiest men in town, and the racket they were running out of God's house, The Temple. (you recall he once made a whip and drove them out whip snappin') Jesus rescued the Jewish people whom he loved out from under these crooks, and showed them a better way...the way acceptable to his father. it was called "The Way" at first, but after he layed-down his life for all who would ever appreciate..."christianity"
This man is a criminal claiming to be a Christian. Either that or he's nuts. A lot like Al Qaeda and others of its ilk. Even if he is a 'Christian Fundamentalist", I do not see celebrations on the street by Christians or Christian Leaders praising his actions. I only see the condemnation and disgust from Christians for the actions of this terrorist (murderer). Trying to label the actions of one man on a whole religion is just insane, especially when his actions are OPENLY denounced and repudiated by Christians EVERYWHERE. You all need to read 1John5:19"the whole world is lying in the power of the wicked one". And Ecclesiastes 9:11 read:"Because time and unforeseen occurrence befall them all". Also read 1Corinthians 8:5. True Christianity have nothing to do with what happened in the world today. Jesus said his followers are no part of the world at John 17:14,15. He is a christian terrorist, just like the biggest terrorist of the 21st century: George Bush. Bus said many times he only did what jesus told him to do - including invading a country which did us no harm and murdered hundreds of thousands of people. Why hasn't Bush been prosecuted? Only when humanity rejects all religion will we be free. It is the #1 mental health problem in the world. Can i propose another debate? From this guy here: http://www.whitehousevoice.com/Kazmarek/Proposals/Giving-a-voice-to-a-mass-murderer–1563 he defends that the thoughts and ideas of mass murderers should not be published. So there you go, a new debate, should we give a voice to a mass murderer? And let him enjoy the fame he was looking for? Isnt this encouraging others to do the same? Would it be censorship if we don´t publish all the info available? Just wondering why aren't they calling him a terrorist in the media? God forbid he was Muslim, it would be the first thing he would be called. I guess it has something to do with the copyrights and it is exclusively used for Muslims.